Participants who wish to give a presentation should submit an abstract in the style, layout and format of the pattern and in accordance to the options listed below. The abstract should clearly and concisely describe the material and results being proposed for presentation. Submitted abstracts will be available on the Institute’s website (www.igipz.pan.pl) from August 2013 and also will be published in a Book of abstracts. 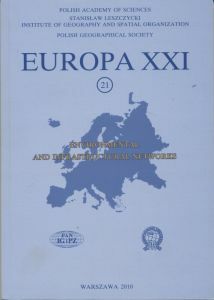 There will be an opportunity to submit papers in scientific journals like Geographia Polonica or Europe XXI. Full texts should be delivered till 30 November 2013 due to publication process. Editorial requirements for Geographia Polonica are avaible here.